Legislation being pushed to allow minors as young as 12 to decide to end their lives; religious leaders of all faiths horrified. A controversial proposal to allow euthanasia for minors in Belgium intensified today (Wednesday), as supporters and opponents both tried to press their sides of the case, AFP reports. Belgium is currently one of the few countries in the world to allow euthanasia for adults, along with the Netherlands and Luxembourg. 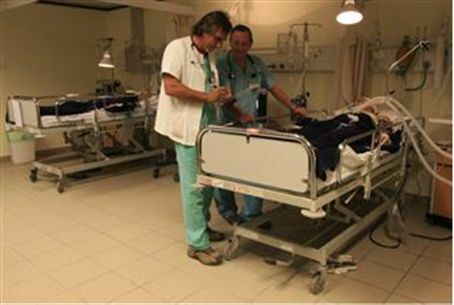 Belgium logged a record 1,432 cases of euthanasia in 2012, up 25 percent. However, mercy-killing laws in the Netherlands allows euthanasia for children under the age of 12 in cases of incurable diseases, whereas Belgian law currently does not. On Wednesday, 16 pediatricians called on lawmakers to vote for a practice some experts say already happens outside the law. "Why deprive minors of this last possibility," they said in an open letter, arguing that under-18s were able to make an informed and mature decision when facing death. "Experience shows us that in cases of serious illness and imminent death, minors develop very quickly a great maturity, to the point where they are often better able to reflect and express themselves on life than healthy people." 75% of Belgians currently support the bill, as long as minors have the ability to make the decision for themselves. Despite this, the move has drawn strong criticism from some public figures, including much of the religious population, who claim that euthanasia of minors could negatively impact the very fabric of society. "We express our deep concern at the risk that such a grave subject will be increasingly trivialized," said a group of Christian, Muslim and Jewish leaders. "The euthanasia of fragile people, be they children or incapable, is totally inconsistent with their condition as human beings. We cannot accept a logic which will lead to the destruction of society's foundations," they said. AFP reports that a definitive and final vote will probably not occur until as late as May 2014, due to problems with political tensions in Belgium's coalition government.